This is the first time I paired red with blush pink and I have to say i love this color combination. I’ve always thought that the two colors don’t really compliment each other but now i’ve been proven wrong! It’s funny how my favorite color is grey but I always end up wearing more bold and bright colors. 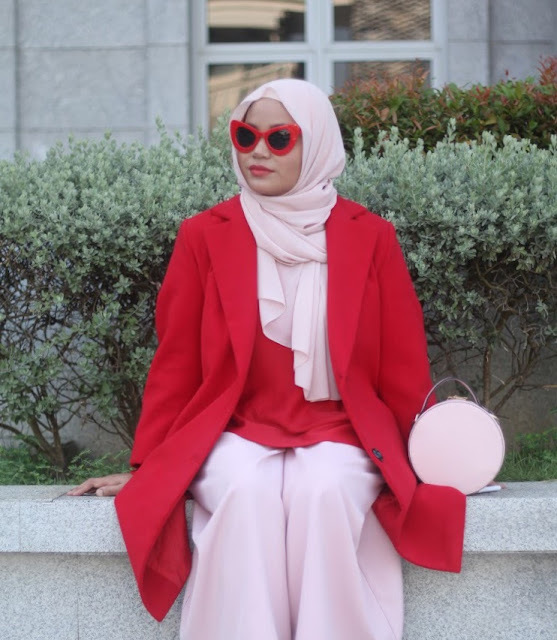 I’ve had this red top for ages, its actually a kurung top which happened to be exactly the same color with this coat i got from www.lightinthebox.com. I think the key to going bright and bold is to keep everything else simple and clean. My round bag perfectly completed the look and gave it that extra polished look. I'm currently obsessed with Mansur Gabriel bags but if you can't afford luxury brands like me, then there's always cheaper inspired options! After all. it's not about what you wear, it's HOW you wear it!